Oh how does Jenni's garden grow? When she's trying to move and manage a complete home renovation elsewhere? Well, let me tell you, it's a little sad. But my garden in Rainier does have a few veggies growing. 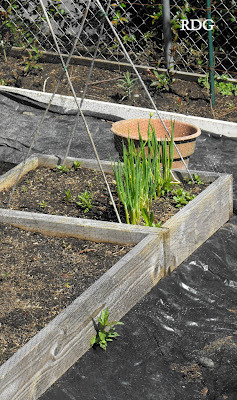 The garlic that I planted last fall is thriving. What the heck I'm going to do with all this garlic come harvest, I have no idea. 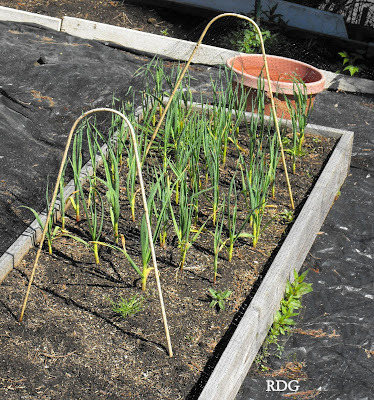 I was able to successfully winter over the green onions I planted last spring. I've used them in dinner recipes, but they keep coming back! I had no idea they would keep coming back. 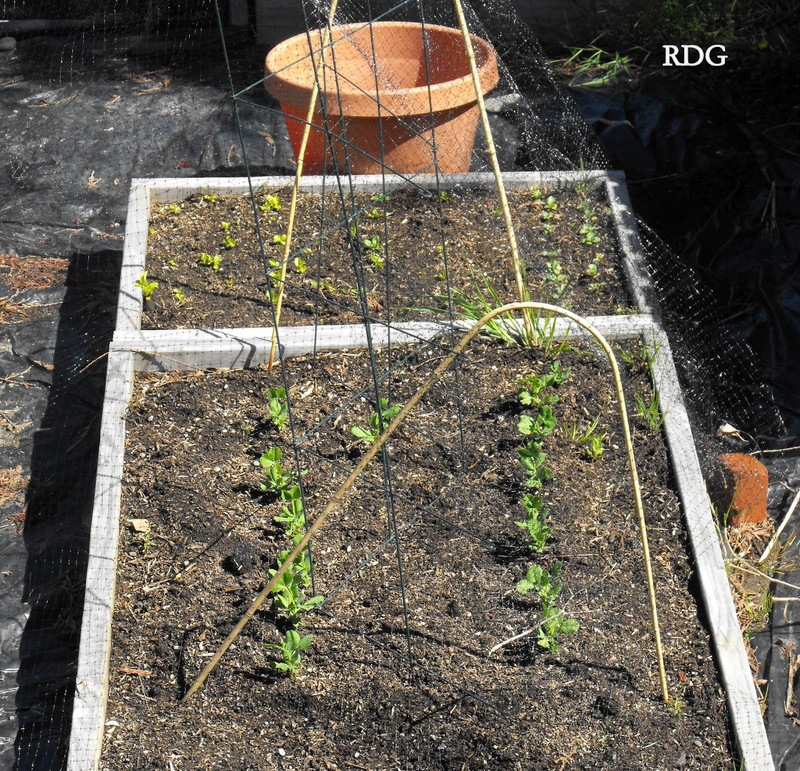 This past February, I sowed snow pea seeds, directly in the my raised beds. It was an experiment to start that early, but the La Nina winter didn't really allow for any growth. They have all sprouted and have been happily growing once the sun came out. Above them are sad little lettuces. If Peter Rabbit showed up, it would take him all of 2 minutes to eat my lettuces. I've also started my potatoes in buckets. That method worked out nicely last year. Because you can never have enough strawberries, I took some of the starts from my bed and added them to a couple of my larger pots that hold dwarf burning bushes. Why not? They'll fill in and will be easy to transport to the new house this summer. Also, dreams of a medicinal / herb garden roam around in my brain. I'll be bringing my pot of mint over as well as another container of herbs to start it off. 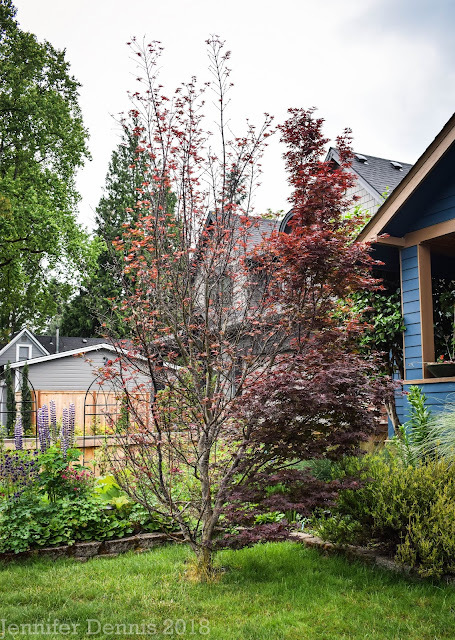 Overall, my plan with managing my gardens in Rainier and then building new raised beds in West Linn is to do the spring garden in Rainier. So, pea's for example are being grown in Rainier. I've started many veg seeds in preparation for my new garden in West Linn so all the summer loving plants will get started there. 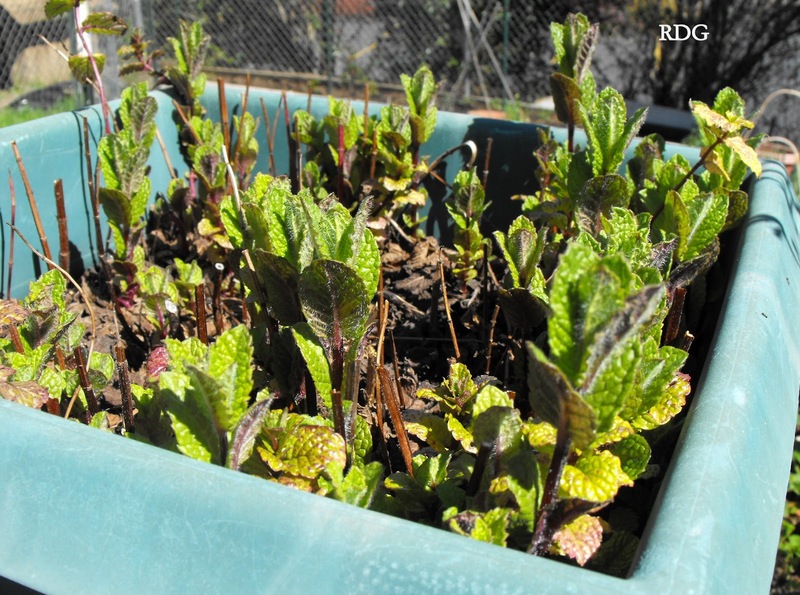 Potatoes in buckets started in Rainier, will be brought over to West Linn. Sometimes I feel like I'm herding cats with all these plans. Oy! Jenni, you sure are busy juggling both gardens. I know when I moved, I wanted to take practically every plant with me. 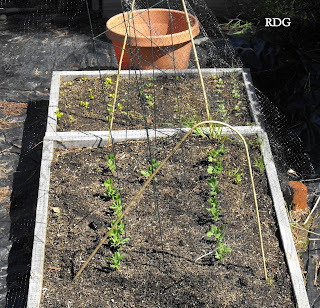 Your veggie garden still looks better than mine and I'm only taking care of one! I think it'll be worth all the work this summer when you have food to eat at your new place. It must be getting exciting knowing that you'll be in your new place before long! 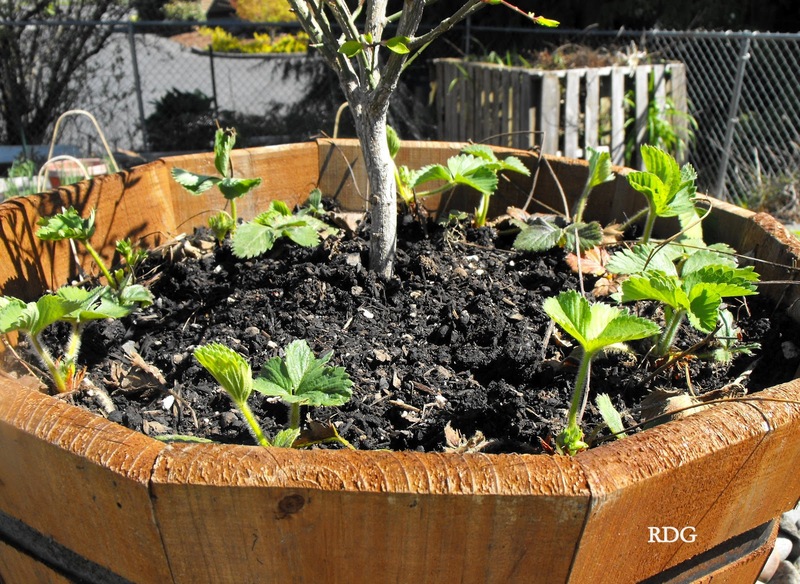 What a great idea to put strawberry starts in the soil around your shrub. That's a good way to keep them going till you can transplant them into your new garden. You're really smart to be so organized as to have plans for both gardens, and not just flying by the seat of your pants, which is what I would be doing in your shoes. I have way more garlic than I'm going to need too. I'm thinking I might roast it when it's ready, process it into a paste, and then freeze it. Alison, brilliant idea on the garlic!! I could have the same garlic problem! The garden will be nice if all of your plan and plants work out. It is always hard to prioritize between what I want to do and what I should do, however being a nurse, you are much better at this than I am. I'll follow your progress and cheer you on! IG - I'll take all the cheers I can. Someday's thing feel bright and possible, other days it's quite overwhelming. You are busy, Jenni! You reminded me about green peas, thank you! I planted early broccoli, cabbage and lettuce seedlings, and what do I have? They all are eaten, except lettuce. I found crane fly larva in that raised bed! So much for an early fresh veggies! Thank you for your comments on my blog! I appreciate them! Jenni, gardening makes juggling with meat-cleavers look easy! Trying to grow veg etc while moving house must be an even bigger challenge. I've been in my present house for over 20 years, but I still remember how sad I was at having to adandon an extensive herb collection at my last place. Re the comment you left on my blog: although I don't consider myself an authority by any means, I do have some experience with raising plants from seeds, which I would be only too happy to share with you or anyone else who wants it. If there is anything specific on which you need advice, please feel free to email me (email address on my Blogger profile). 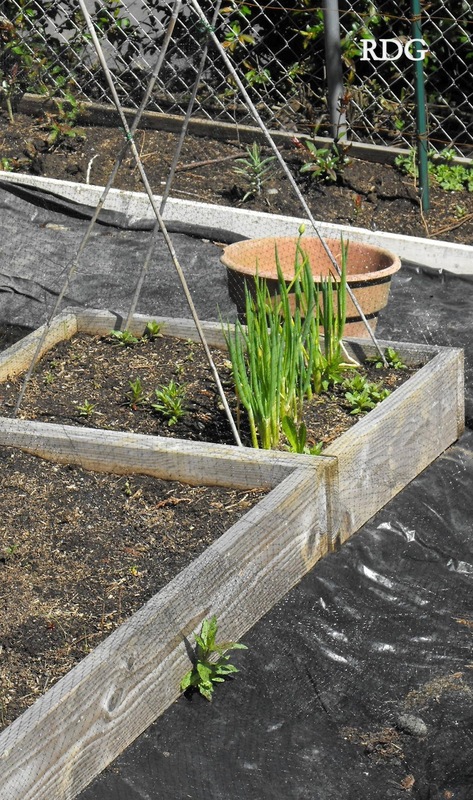 I always appreciate your blog Mark, it's full of great gardening information! Hello Jenni, I haven't visited in a while and am intrigued to see what you've been up to! This is such a slow spring on this side of the Atlantic as well. Hey Julia ~ when I get that medicinal garden growing, I'll share :) Right now, it's all in my head. lol. How far away is your move? It sounds like you have planned well as far as the gardening part goes. I had to laugh about the garlic. I should probably plant less, too. I need to check my garlic in the basement to see if the bulbs are still firm. Last time I needed some garlic, it was still good, but I think there are probably some that can go onto the compost pile. Hopefully, your lettuce will grow so you can eat it. Hi Sue, the move is about an hour and half away drive time. Lot's of trips back and forth right now. It's hard on the kiddos. I bought the smallest amount of garlic bulbs you could purchase from the seed company...lol! I'm hoping I can gift a lot of it during the holidays.